“In 2018, the total loss for sprinkler-controlled fires was $3,733,250; the value of the property protected (building and contents) was $217,817,043. 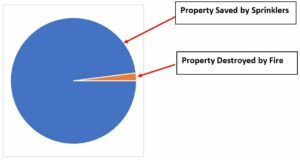 This equates to 1.7% loss (or 98% save).” When examining the average building and content losses from fire, the same remarkable achievements were shown: 98% of property was saved from fires when protected by sprinklers. WOW! Way to go, Minnesota sprinkler contractors!